The tart is still warm from the oven, and the pastry is crisp, baked to golden brown perfection. As I pick it up, the custard centre wobbles ever so slightly. One bite and I can understand why this, of all the pastéis de nata in Portugal, is the one for which people queue up every day. I’m at Antiga Confeitaria de Belém in southwest Lisbon, which has been making custard tarts since 1837. In the 19th century, the space was a sugarcane refinery with a small shop attached. Meanwhile, at the next-door Jerónimos Monastery, the monks used egg whites to starch their laundry, and made delectable custard tarts with the leftover yolks. With the liberal revolution of 1820, all monasteries were shut down and the monks were forced to leave. 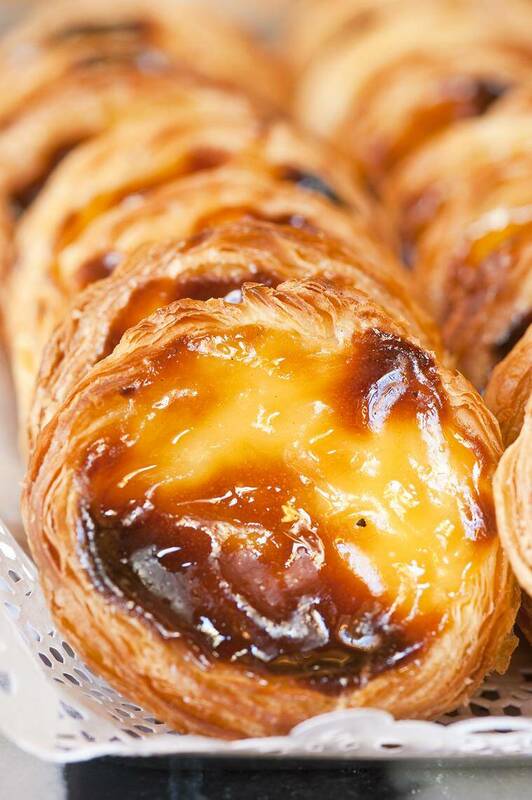 Some of them started selling the tarts at the shop, and they quickly became known as pastéis de belém (the only place that can use this name; elsewhere in Portugal they are called pastéis de nata, singular pastel). “In the beginning of the 20th century, our family took over the shop and the monks’ secret recipe has been with us ever since,” says Miguel Clarinha, the manager and the fourth-generation co-owner of this family business. He gives me a behind-the-scenes tour of the factory. The custard and dough are made using the 200-year-old secret recipe, which is known only to the family and to the three chefs who actually make them. Obviously, I’m steered away from the door marked “segredo” (secret) to a spotless room where a group of women is rolling out the prepared dough, cutting it into pieces, and pressing it into small tart moulds. Trays full of moulds go into the next room where the warm custard is piped into them. “The tarts are then baked for 20 minutes at 400°C, to cook the dough without burning the custard,” explains Clarinha. They are slightly cooled, and “de-moulded” before being sent to the hungry customers waiting outside. “We make 20,000 of these tarts every day, and both the locals and tourists line up for them,” Clarinha says proudly. The pastéis may be the most famous Portuguese dessert, but it’s by no means the only one. The number of incarnations of sugar, eggs, and flour in Portugal is astonishing. There is a pastelaria (pastry shop that doubles up as a café) in every neighbourhood where locals socialise over coffee and pastry. As I travel the length of the country, stopping by in big cities and small towns, I find that every place has a sweet specialty all its own. Aveiro is known as the Venice of Portugal, a city of canals crisscrossed by humpbacked bridges and flanked by Art Nouveau buildings, with colourful moliceiro boats gently plying the waters. Here, I encounter the ovos moles de Aveiro — moulded sweets with an egg and sugar filling encased in a delicate wafer shell. I visit Casa dos Ovos Moles, which has been making these sweets since 1882. Legend has it that a nun at the nearby Convent of Jesus had been ordered to fast by her Mother Superior. Unable to contain her hunger, she used the ingredients at hand — eggs and sugar — to make a sweet mixture, which she wrapped inside the dough used to produce the hosts for Catholic Masses, and, thus, was born Aveiro’s claim to fame.